Throughout this extraordinary day of free entertainment, festival-goers interact with dozens of participating sponsors before, during and after the event. Sponsors are offered on-site booths positioned in high-traffic locations, creative brand activation opportunities, and robust advertising on-air and online before and after the event. The perennial popularity of this annual event and its fun, celebratory atmosphere create a unique opportunity for sponsors to connect with customers, strengthen brand awareness, and make a lasting impression. 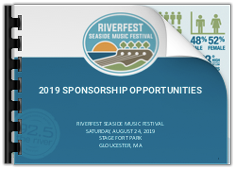 To learn more, please take a moment to check out this PDF detailing 2019 Sponsorship Opportunities. Then contact us — either directly or using this page’s form — and a representative of 92.5 the River will be glad to learn more about your needs and discuss various opportunities for your business at this year’s event!